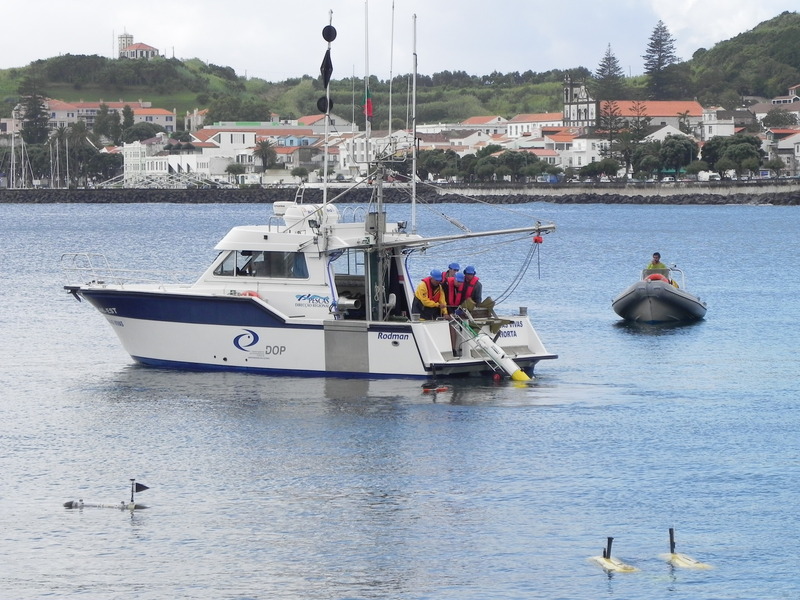 From 8 to 18 September 2014, the Center of IMAR of the University of the Azores is hosting the sea trials of a new type of robotics-based distributed sensor system, aimed at affording marine scientists and commercial operators a revolutionary tool for marine habitat mapping in complex 3D environments. The tests are being performed in the scope of the EC research project MORPH, entitled Marine Robotic System of Self-Organising, Logically Linked Physical Nodes. Launched in February 2012, the 4-year research project MORPH is partly funded by the European Union’s Seventh Framework Programme with a budget of 8,5 million Euros. The major goal of the project is to develop a distributed robotic underwater system carrying complementary sensors for complex underwater mapping missions. At the core of the innovative solution adopted is the concerted operation of a number of relatively simple, affordable vehicles, capable of cooperating seamlessly and behave as an ensemble, yielding a “MORPH Supra Vehicle”. Research engineers, marine biologists, and commercial partners have been working together to meet the formidable challenge of affording scientific and commercial end-users an advanced mapping system capable of accessing inhospitable areas and operating under scenarios that defy current technology; e.g., to perform underwater surveys over high-relief seafloor with complex 3D structures (canyons and rugged cliff areas) in the presence of reduced visibility and natural unforeseen obstacles. To prove the concept of a MORPH Supra Vehicle, the tests take place in the beautiful setting of “Baia de Porto Pim”, in Faial Island (Azores). The area is perfect to operate a MORPH ensemble of five vehicles for the first time, undergoing cooperative motion while acquiring video and sonar data to map the sea bottom. What is so special about the MORPH Supra Vehicle is that its building blocks (a set of small robotic marine vehicles) operate in a cooperative manner, as if they were a single, powerful vehicle, capable of carrying advanced, complementary sensor suites, and reacting to environmental conditions in real time. The ongoing trials focus on the execution of an optical and acoustic survey mission with one surface and four underwater vehicles moving in formation and avoiding obstacles detected online. This is an important step towards the execution of the final scenario mission, planned for 2015 in the Azores, where the system will be used to perform an underwater survey to acquire data and map black coral communities growing in an underwater cliff in Monte da Guia, Faial Island. The MORPH system developed in the scope of the project is expected to offer an innovative solution to a number of problems in field applications such as: environmental monitoring, exploration of marine resources, archaeological surveys, harbour protection, monitoring of industrial infrastructures (offshore wind power installations, pipeline), and sea mine detection, to name a few. From an engineering standpoint, the problems that are being addressed and solved are at the forefront of underwater robotics technology, namely in what concerns cooperative mission programming, navigation, and control, as well as acoustic communications and vision-based habitat mapping. The MORPH team participating in the trials consists of 35 scientists from five countries and nine member organizations: ATLAS ELEKTRONIK (Germany, coordinator), IMAR (Institute of Marine Research, Portugal), Instituto Superior Tecnico (IST, Portugal), Jacobs University Bremen (Germany), Ilmenau University of Technology (Germany), Ifremer (France), Universitat de Girona – Computer Vision and Robotics Research Institute (Spain), NATO STO Centre for Maritime Research and Experimentation (based in La Spezia, Italy), Consiglio Nazionale delle Ricerche – Istituto di Studi sui Sistemi Intelligenti per l’Automazione (CNR-ISSIA, Italy). Next week the MORPH team will welcome Dana R. Yoerger, Senior Scientist, Dept. of Applied Ocean Physics from the Woods Hole Oceanographic Institution (WHOI), who participates as a scientific advisor. The US based WHOI is the largest private, non-profit oceanographic institution in the world. It is dedicated to research and education to advance understanding of the ocean and its interaction with the Earth. Our two vehicles participate in the trials GIRONA500 and SPARUSII.